We've previous put up a demonstration and explanation of capillary action using flowers, but this one is also quite fun. Simply fill two small glass containers with water, putting plenty of blue food colouring in one, and yellow in another. Connect the two containers to an empty middle container with absorbent paper. The paper absorbs the water, and through capillary action, the water moves through the paper to the middle container. After a few hours, this middle container has the same amount of water as the external containers, and you can see the effects of mixing blue and yellow (it makes green). 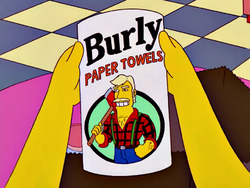 Make sure your paper is burly.